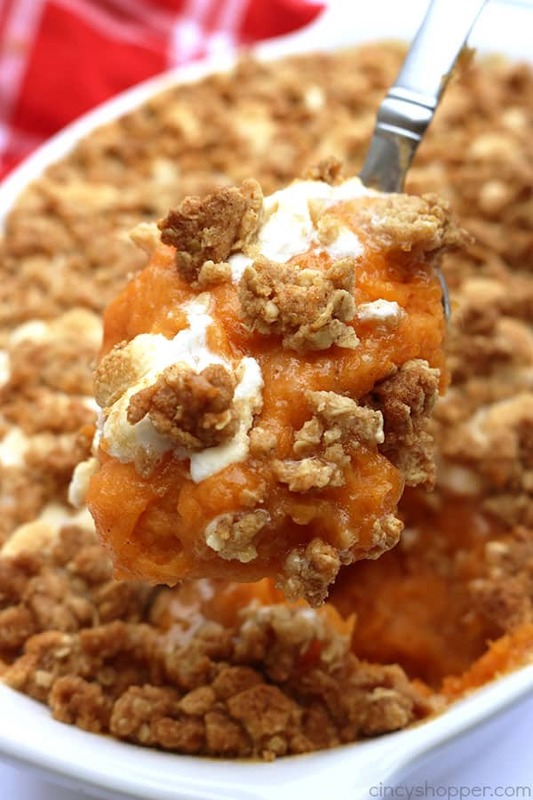 This is absolutely the BEST Sweet Potato Casserole ever. Since this casserole includes a delicious streusel type topping, it makes it like no other. Perfect for Thanksgiving and Christmas dinners. I know many of you are planning your Thanksgiving dinners in the next few weeks. 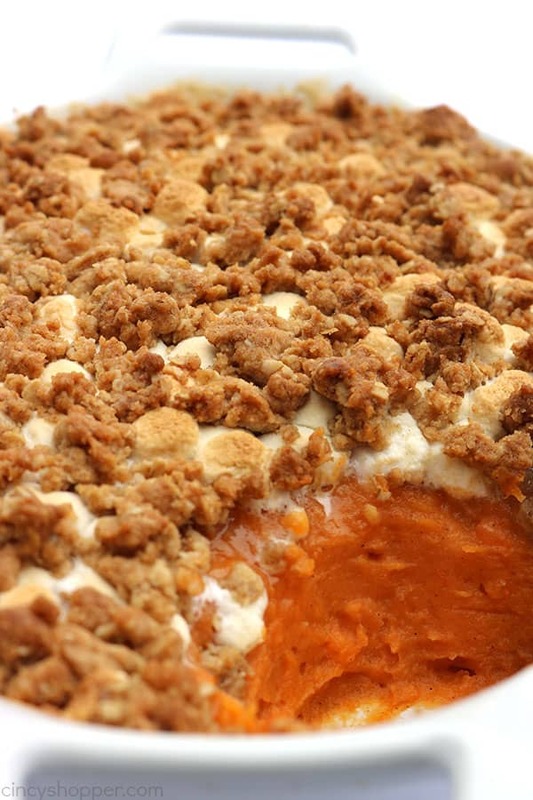 You really need to add this Sweet Potato Casserole to your menu. You will thank me, I promise. 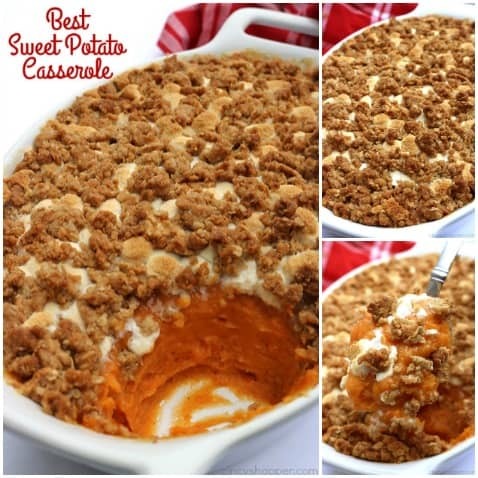 Normally, I like to make our Slow Cooker Sweet Potato Casserole because it is so simple and easy to throw together holiday mornings. 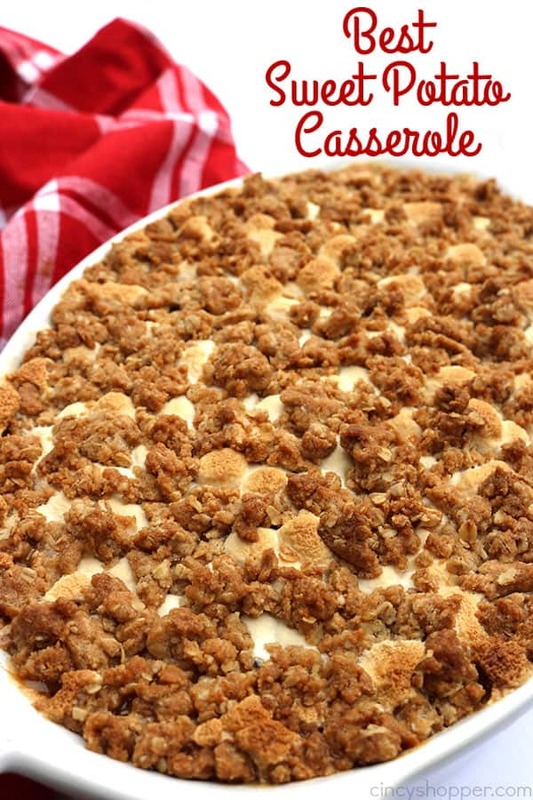 I changed my mind because one of my cousins brought this casserole to our holiday get togethers last year and I knew that I would be making it for my family this holiday season. 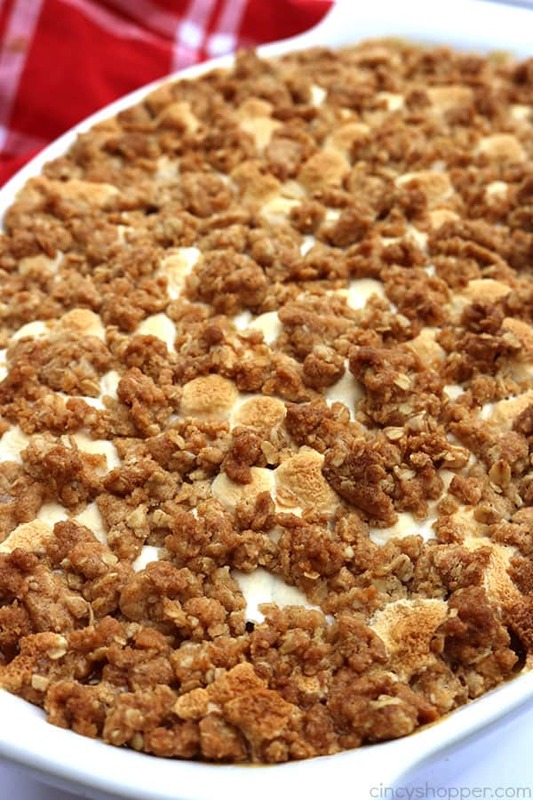 The streusel type topping just takes the dish to a whole different level. Trust me…. Your family is going to love it as much as my family did. I made this yesterday and my kids and their friends finished off the whole dish. They loved it and so did my hubby. 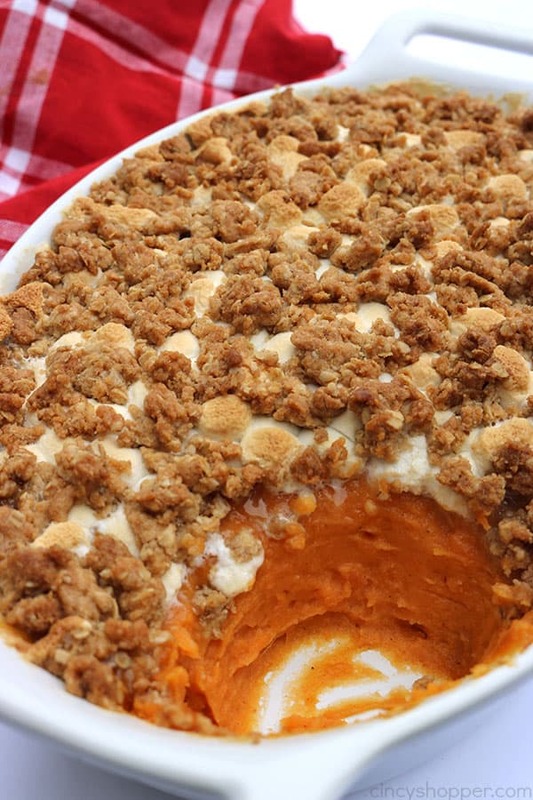 The casserole is not overly sweet or bland which is perfect in my book. 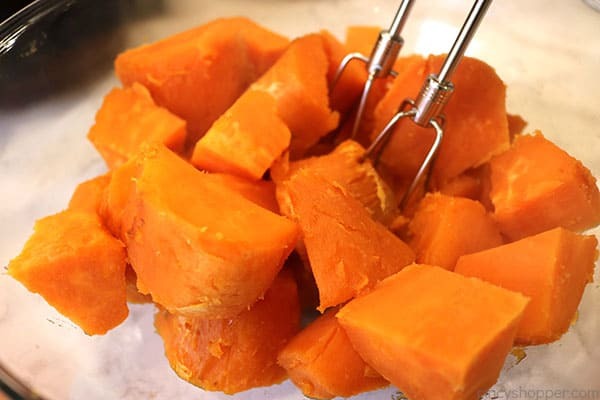 I am considering making the sweet potatoes ahead of time so that it is an easier Thanksgiving morning prep. You could do that as well. Just save the streusel for day of. I have so many new holiday dishes I plan to share with you in the next few weeks. 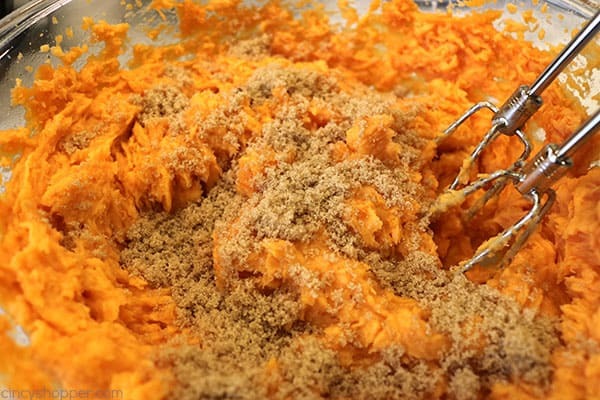 We have been testing some new side dishes to add to our holiday meals. The recipe calls for some simple ingredients. If you do not have half and half on hand, you could use milk or even a heavy cream. I used a salted butter. If you are using unsalted, you can add in a dash of salt when making the casserole. 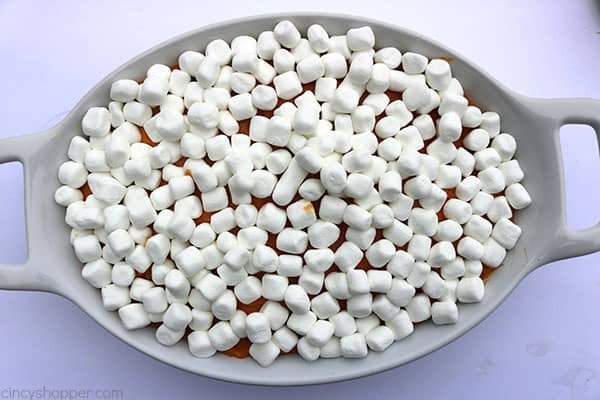 Miniature marshmallows will work best but you could cut large ones in half if that is all you have on hand. 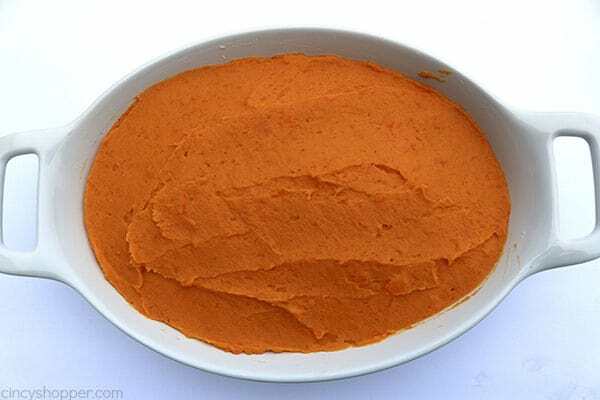 Wash and pierce sweet potatoes. Then place on prepared pan. 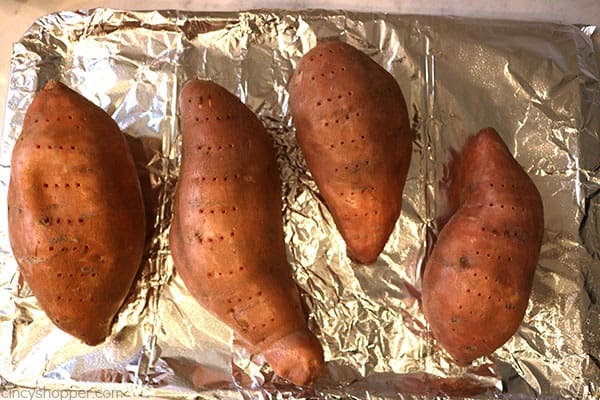 Remove skins from potatoes and discard. 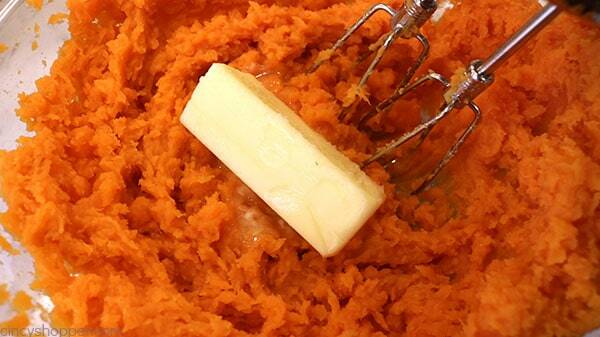 Add 6 tablespoons butter and beat until creamy. Add Vanilla, 1 cup brown sugar, 1/2 cup Half and Half, 1/2 teaspoon Cinnamon and 1/2 teaspoon Nutmeg. 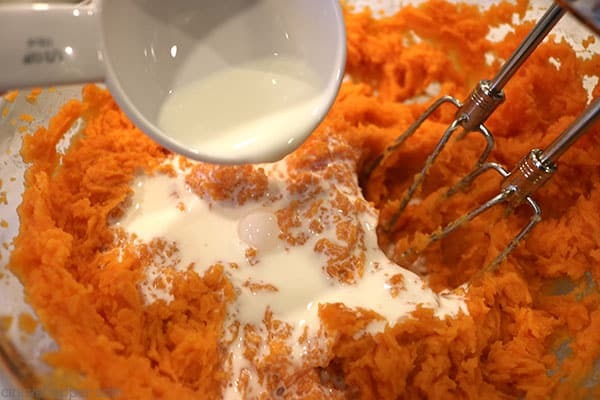 Heavily butter 2 quart casserole and add sweet potato mixture. In a small bowl, melt 4 tablespoons butter in microwave. 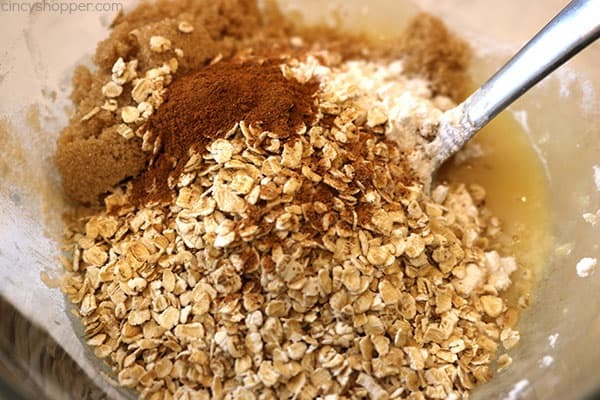 Add flour, 1/3 cup brown sugar, quick oats, 1/4 teaspoon Cinnamon and 1/4 teaspoon Nutmeg. 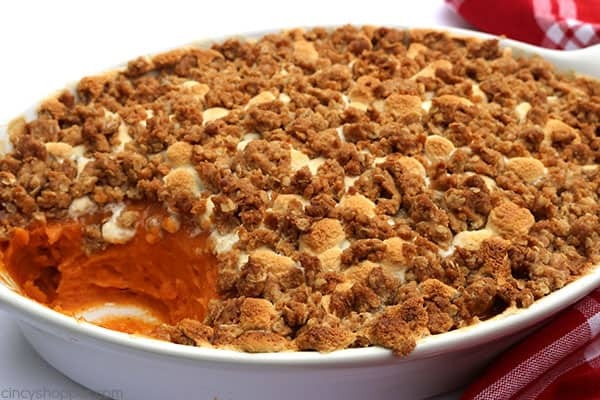 Does your family holiday menu always include a sweet potato casserole? This looks really good! 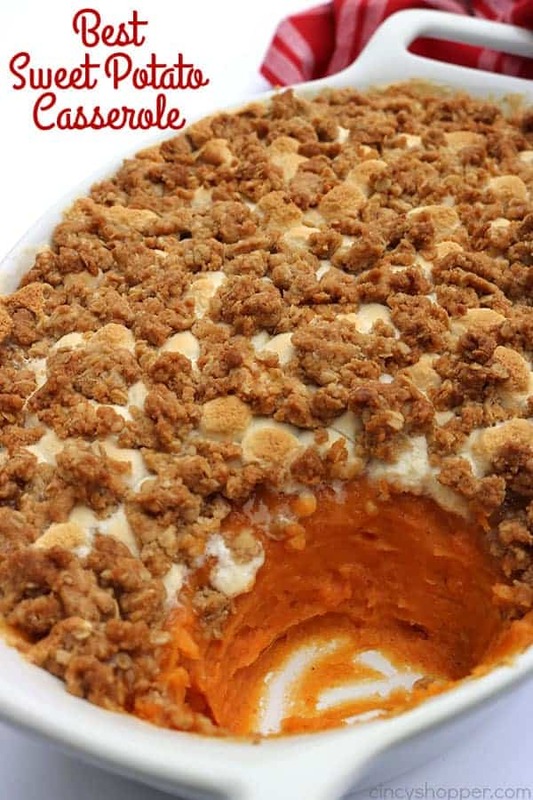 Since I’m making a lot of stuff for Thanksgiving, can I make this the night before and warm it up before serving? We’re having Thanksgiving lunch instead of dinner. What about the steps for the vanilla? It’s in the recipe. After beating and adding butter. Do you think you could make all of this the night before, and then just pop it in the oven when it’s almost turkey time? Hi Erin! You could. I would be sure to add the topping just before baking though. Happy Holidays to you! Your recipe says 1 Tbsp. 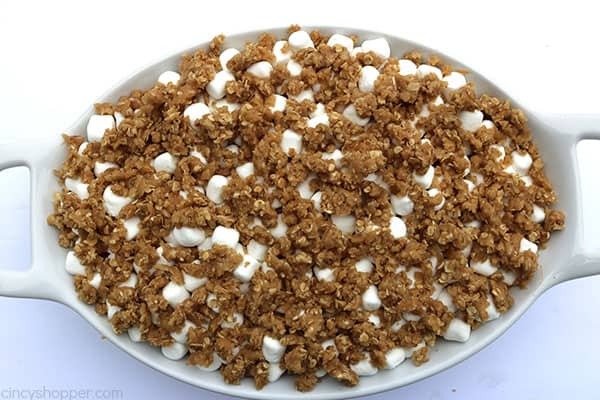 of vanilla but it doesn’t specify if it is to be added to the potato mixture or the crumble. Needs to be edited or have an attachment saying where the vanilla goes. :-) Thanks!! 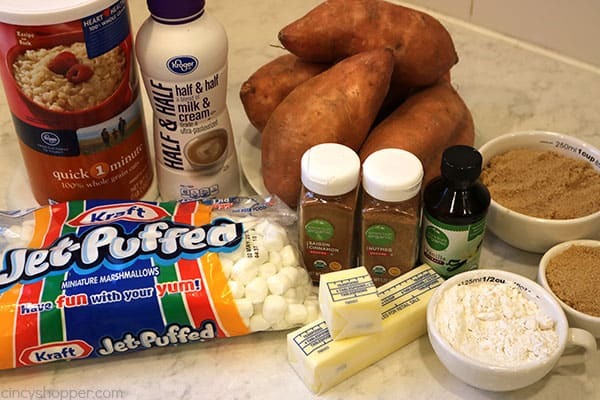 I made this recipe for Thanksgiving and it was a hit! The only thing I am wondering is where in the receipe do you add the vanilla? It’s on the ingredients list but it is not in the instructions. Thanks for your help and the GREAT recipe. The oat topping was delicious!